I had been very keen to trace this workhouse for a couple of reasons. Firstly, I had recently met someone whose grandfather had been born in it. The second reason I will tell you about at the end. As is often the case, the workhouse took over an already existing House of Industry that had been built by the 39 parishes of the Hundred Union in 1765. The remarkable Peter Higginbotham, whose workhouses site is, for my money, the single best website on the internet, records that it was an H shaped building of two storeys with attics, providing accommodation for about 500 inmates. If this is so, then it must have been very like Bulcamp workhouse, which was built the following year. As at Bulcamp, the 1835 act of parliament which transformed the workhouses into virtual prisons demanded the building of a one story administration block across the front of the H block. You can see this on a plan on the page for Barham on Peter's site. An unusual feature of the Claydon & Bosmere workhouse was an isolation block, at arms length across the field. Interestingly, the workhouse and the isolation hospital had separate burial grounds, although there was just one chapel, at the southern end of the western wing of the H block. The workhouse was used as a hospital during the First World War, and given that the isolation block continued in use after the end of the workhouses, it may have carried on this role for a while. By the time of the Second World War, however, its use was transformed to a prisoner of war camp for Italians. After the Italian surrender, these camps became open, so we may assume that there were many Italian voices heard in Claydon high street. It would be nice to imagine that a small proportion of Ipswich's large Italian population can trace their roots back here. In 1959, Pevsner found the workhouse and isolation hospital derelict, awaiting demolition. This followed in 1963. As part of the Tory government's major road-building programme of the early 1980s, the main A45 (now A14) between Cambridge and Ipswich was completely reconstructed and dualled, straightening out all the kinks and bypassing every settlement. The Claydon and Barham bypass was put right across the eastern end of the workhouse site. Meanwhile, the cement workings at Blakenham, on the western bank of the River Gipping from the workhouse, were extended, and Pesthouse Lane, which once had been a narrow lane down to the isolation hospital, was extended to carry heavy traffic across to the quarries. During the 1990s, many (though not all) of these workings were abandoned and flooded, becoming recreational lakes for fishing and boating. 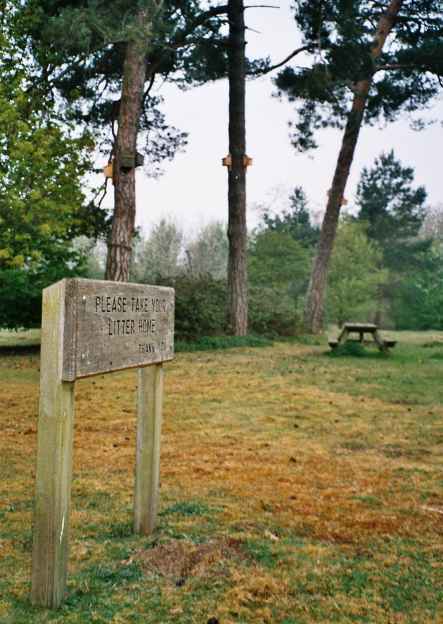 They are known as Barham Pits, and as part of Mid-Suffolk District Council's commitment to leisure facilities, the old workhouse site was landscaped and reinvented as Barham picnic site. 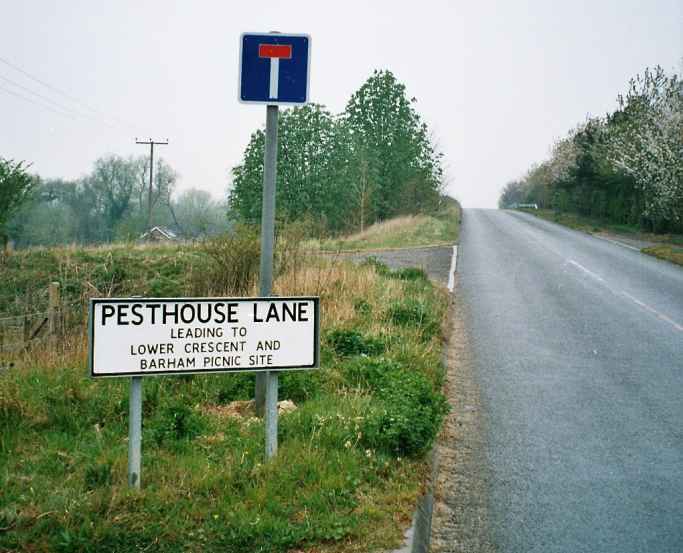 Pesthouse Lane now doubles back towards Barham along what was Workhouse Lane, but this now ends at the A14, meaning that the entrance to the picnic site is rather isolated. This has had an unfortunate side-effect, as we shall see. To all intents and purposes, nothing remains of the site of this workhouse. There are no buildings, and hardly a memory. 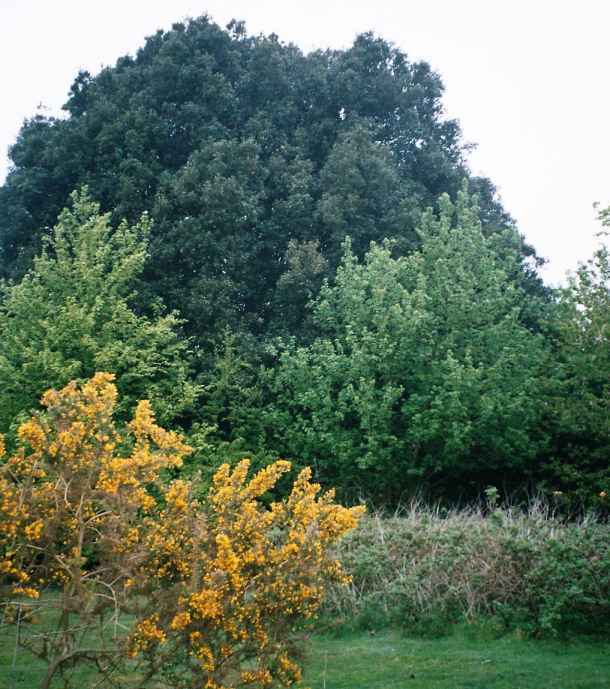 The spring of 2003 had been the warmest and sunniest for half a century, but one Friday towards the end of April the sky was overcast and heavy with rain. A cold breeze blew from the north. I decided that it would be a perfect day to go off and discover the site. I headed up through the Whitton estate, and on to the old Norwich Road. This is now only in use by buses and bikes; automatic bollards halfway along prevent cars from using it as a shortcut. With locked gates and traffic islands as well, it appears not unlike a customs post between two insignificant countries. I headed along Claydon high street just as it began to rain, and shortly after the point where Claydon becomes the parish of Barham, a lane off on the left pointed to Barham picnic site. It is still called Pesthouse Lane. This led me over the storming traffic of the A14. I knew that the site of the workhouse was off to the right here, but a huge screen of trees planted about fifteen years ago prevented me seeing anything. I suspect that the intention is to block off a site of the road from the picnic site, rather than the other way round. The road curves, and below are Barham pits. This is where the isolation hospital was, although it isn't clear to me if the pits have encroached on the actual site of the hospital, or its burial ground. I followed the road around until it was heading back to the A14 and Barham again. A row of early 19th century cottages off on the left must have been contemporary with the buildings of the 1830s - perhaps they were cottages for workhouse officials. Maybe William Nichols or Eliza Miller lived here; at the time of the 1841 census, they were schoolmaster and schoolmistress. Or perhaps Howard and Mary Crisp, Master and Mistress of the Workhouse, lived in one - but I think they must have lived on the premises themselves. The embankment of the A14 blocked the road ahead, and it turned into the open carpark of the picnic site. I was surprised to see that, in such heavy rain on such a cold day, there were half a dozen cars here, but thought no more of it. I locked my bike, and wandered across the recently closed part of the carpark towards what I believed to be the site of the chapel. A sign revealed that this part had been blocked off to stop people abandoning stolen vehicles here. Hmmm. As I walked through into the clearing, a man stepped out of the bushes nearby. He stood watching me for a second, and then went back into the bushes. I wondered if he was walking his dog, and had lost it. 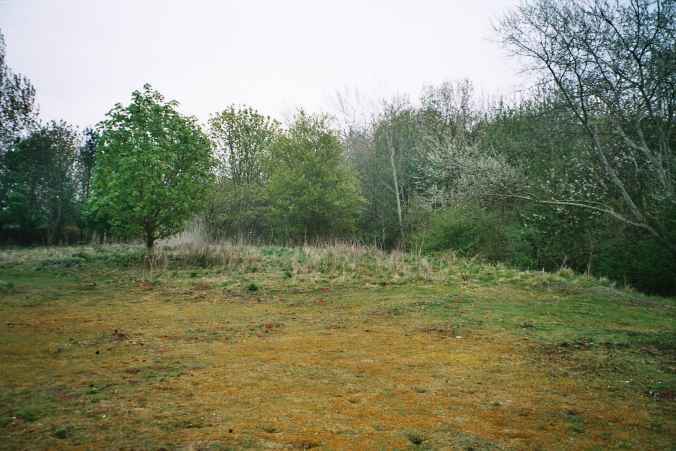 I photographed the place where the chapel had been, but there was no trace of anything. 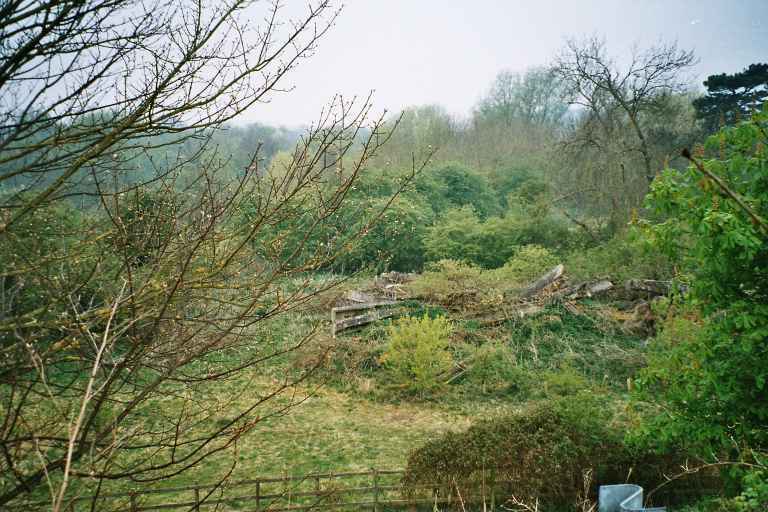 I wondered if a slightly raised area covered with older trees beyond had been the burial ground, but there was no evidence. As I stood there, another man came out of the bushes, walked across my line of vision, and then disappeared back into the trees. Again, he didn't seem to have a dog with him. At the bottom of the site, a wildlife area has been created around a low-lying pond, and here I struck gold. A bulldozer had obviously been used to clear back the site, and its tracks had disturbed the ground. 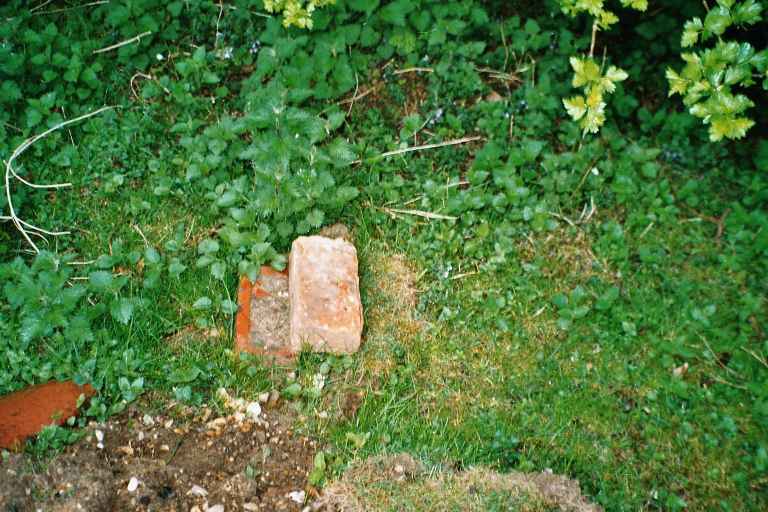 Here, I found about a dozen bricks, mostly red but a couple of white ones, protruding from the ground. Most were broken, but a couple of whole ones were joined together. I had found the last surviving remnants of the building that was once the Claydon & Bosmere union workhouse. I said at the start that there was another reason for wanting to come here. In the mid-1830s, shortly after it had been extended to conform to the requirements of the new act, a young London journalist visited this workhouse. He was writing about social conditions in rural areas, and combining it with a tour of Suffolk to write about the local elections. He was shown the logbooks of the workhouse, and a young boy was pointed out to him who had been apprenticed at the age of 10. The journalist's name was Charles Dickens. Having experienced poverty himself as a child, he was particularly struck by the story of the young boy, and it became the basis for his first great novel, Oliver Twist, published in 1837. I wandered back to the car park, feeling pretty pleased with myself. At this point, a third man stepped out of the trees, looked at me, and then disappeared. It suddenly dawned on me that this was a cottaging site, and I was being cruised (if you don't know what these expressions mean, then you would probably prefer to remain in ignorance). It occurred to me that wandering around here taking photographs was perhaps the most dangerous thing I had done all year. I headed back to my bike. 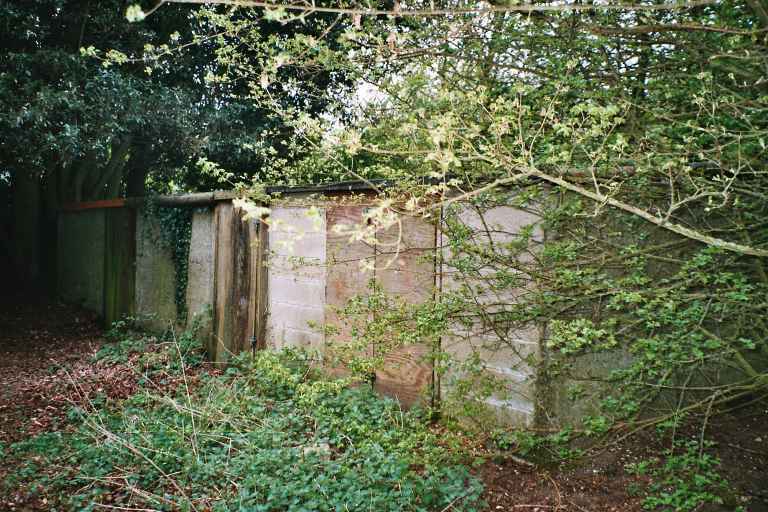 Just as I got to the car park, I noticed a low line of outbuildings, almost completely hidden by trees. Although not Victorian, they must survive from the workhouse's incarnation as a hospital or prisoner of war camp. As I stood contemplating them, camera in hand, I became conscious that a very large man was standing not twenty yards off, watching me. There wasn't a dog in sight. So I unlocked my bike, photographed everyone's car registration plates (I didn't really; even I wouldn't do a thing like that) and cycled pretty energetically back to the top road. As I entered Claydon, the sun came out. Bosmere and Claydon workhouse is now covered by the A14 and the Barham picnic site. 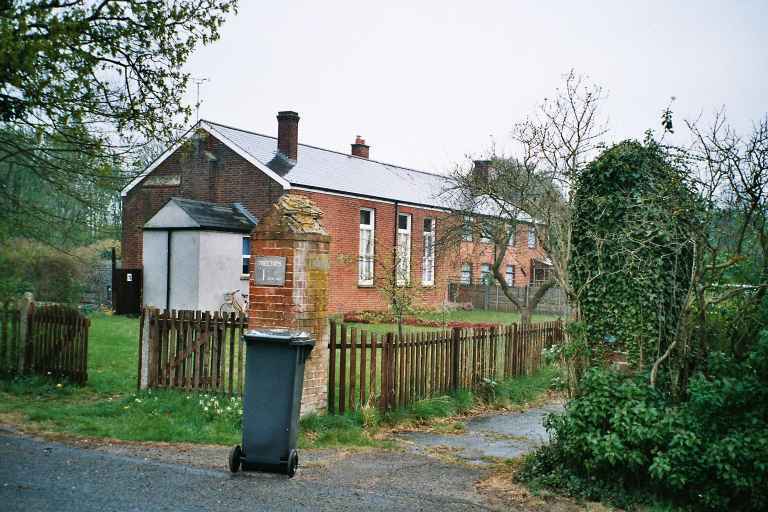 The chapel stood to the south of the car park, towards the trees that screen Pesthouse Lane.